This program is ideal for people who have recently brought home their puppy or are about to get a puppy. Beginning on Day 1, your puppy needs to have structure and a positive role model to teach him/her appropriate behaviour. The benefit of this program is that training can start right away, as soon as you get your dog. 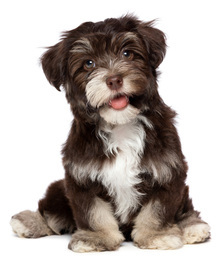 Since your dog cannot interact with other dogs unless he/she has had all the necessary vaccinations, group classes cannot begin right away (as young as 6-8 weeks), however, this in-home puppy training program allows our trainers to start working with you as soon as you take your puppy home. This program provides covers housebreaking (toileting), mouthing/nipping, socialization, appropriate play, crate training, introduction to the leash and obedience, exercise, as well as dog communication and behaviour. A trainer will work with you in your home on the above topics among many others, depending on your dog's needs and your training goals. Similar to our private training program, this program is customized specifically for you and your dog and includes 5 in-home puppy training sessions.